Ever since I started this blog, the experience of going out to eat – whether it be for a meal or a bakery run – has changed for me. It’s become a bit of a scavenger hunt with the endless goal of finding more and more chocolate peanut butter treats to share with you. It feels like a win whenever the goal is fulfilled, but the win is all the more special when I get to try something I’ve never seen or eaten before. This was one of those wins! We were on our way home from Williamsburg, Brooklyn last night when Taste Tester suggested swinging by our favorite bagel place, The Bagel Store. At 11:30 pm I was skeptical that they’d be open but he noted that we were in Williamsburg and bagels are “a great cheap drunk food”. We made it there with 1/2 hour to spare. Nice! 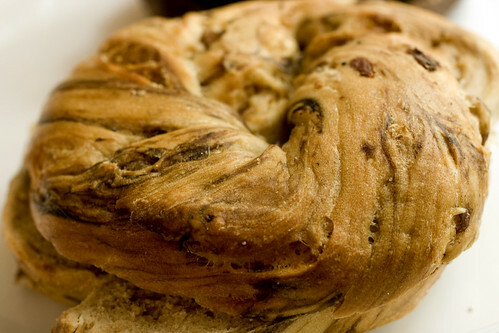 We were about to order our usual (which would be our favorite flavor: their a-may-zing french toast bagel) when we spotted peanut butter cinnamon raisin bagels – ! And right below those was a basket of chocolate bagels. 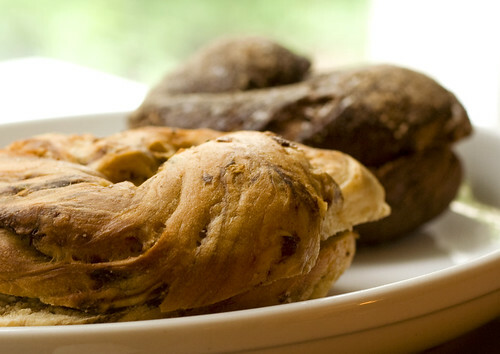 Not chocolate chip bagels like they have at Panera – chocolate chocolate chip bagels. Jack. Pot. We bought a mixed bag of half a dozen bagels to take home and freeze. Freezing bagels works nicely for us because we don’t have to cross the tunnel, borough and bridge it takes to get to Williamsburg every time we want a Bagel Store bagel. To prepare them, you just microwave until soft all the way through, then toast. While these crisped up in my toaster, I kid you not – it smelled like I was baking chocolate peanut butter brownies. The wait was killing me! Of the two, I preferred the peanut butter cinnamon raisin. Taste Tester regularly eats cinnamon raisin bagels topped with peanut butter but I can’t do so because peanut butter + bagel would just be too much for me. So I got a nice compromise with this bagel: the peanut butter flavor without the added heaviness. 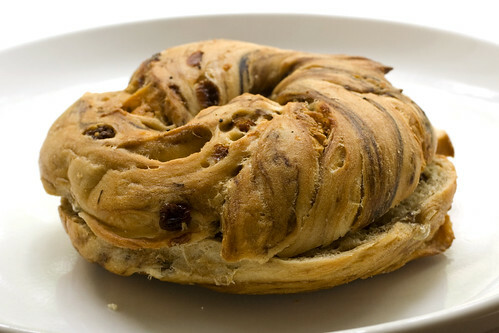 It had just the right amount of peanut butter flavor too; it wasn’t enough to be overwhelming, just enough to satisfy and to set it apart from your typical cinnamon raisin bagel. 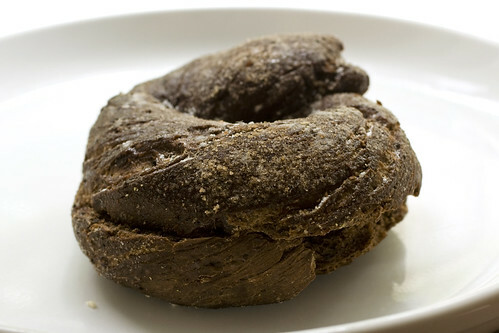 The chocolate bagel had somewhat of an odd flavor and texture. It was a little more crumbly than your average bagel. The chocolate flavor was very deep and cocoa-y with almost kind of a burnt flavor to it. It wasn’t near as sweet as you’d expect which is a good thing because no one likes a morning sugar rush. To taste these bagels, Taste Tester and I ate half of each bagel. I topped both of my bagel halves simply with butter. I tried them separately, then topped the peanut butter half with the chocolate half to taste them together in the same bite, which was also quite tasty. I got to eat CPB for breakfast without a crazy amount of sugar. I was a happy girl! While I can’t say the peanut butter cinnamon raisin and chocolate bagels were as good as their fellow french toast bagel, they were a totally worthy cpb adventure. The next time you’re in Williamsburg, swing by The Bagel Store. Eating something dessert-like for breakfast is fun because it feels like you’re doing something against the rules. The other day I was thinking about how many chocolate peanut butter breakfasts I’ve made and eaten since starting this blog. So I made a flickr gallery for any of you breakfast lovers, complete with links to blog entries and recipes. Check out the photos on flickr. The bagels sounds pretty good, but I just looked at the Bagel Store’s menu, and saw that they charge for lettuce and tomato…that just irks me, not sure I could do business. Those bagels look pretty good! I’ll have to try a Peanut Butter one if I ever head out to NY. I’m not sure how I feel about the chocolate bagel though!